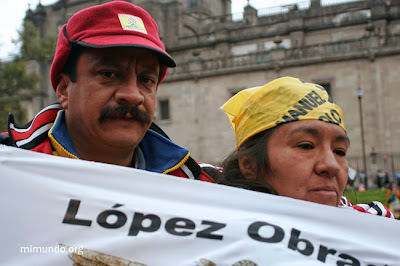 Issue: Elections The July 2006 Presidential elections in Mexico were by far the closest in the nation’s history. 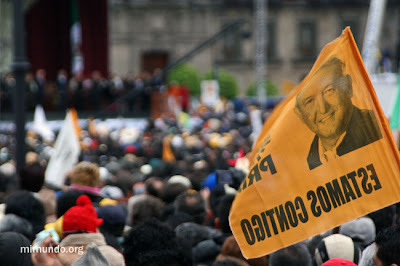 Leftist candidate and former mayor of Mexico City, Andres Manuel López Obrador (AMLO), from the coalition “For the Benefit of All”, lost by less than 1% to Felipe Calderon, representative from the right leaning and incumbent National Action Party (PAN). 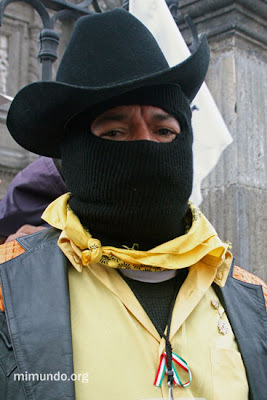 The narrow margin has deeply polarized Mexican society as a large number of Mexicans believe fraudulent methods were used in order to transfer power within the same political party. 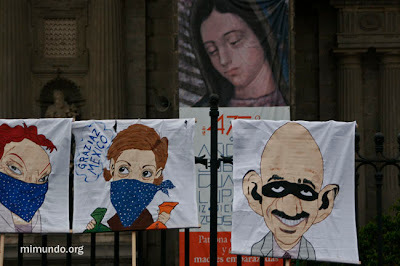 The past few months have seen widespread action from supporters of López Obrador, as Mexico City’s main square, known as El Zocalo, and Avenida Reforma, one of the capital’s main thoroughfares, were occupied by sympathizers of AMLO who demanded a “vote by vote” recount. 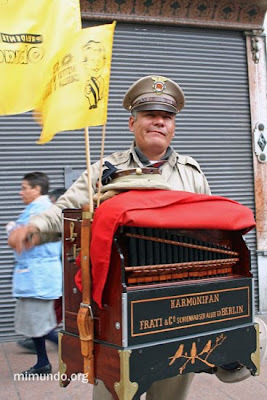 Mexico’s highest electoral authorities eventually rejected the recount, causing further skepticism amongst those who feel Mexico’s president has once again been chosen through fraud – a common practice during the 71 years in which the Institutional Revolutionary Party (PRI) ruled. 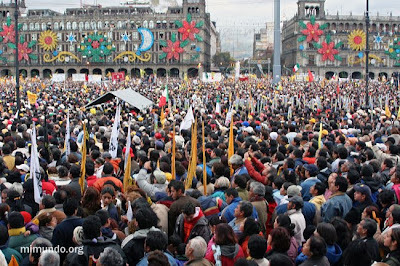 On November 20th, 2006, nearly 100,000 supporters of López Obrador filled the Zocalo in order to witness an alternative inauguration in which Mexico City’s former mayor was symbolically sworn in as the “legitimate President of Mexico”. 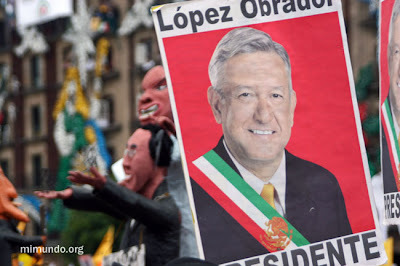 Coinciding with the 96th anniversary of the Mexican Revolution of 1910, López Obrador has vowed to bring reform and described the ceremony as the beginning of a “new republic against a neo-fascist oligarchy”. 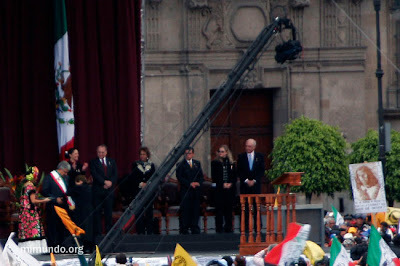 López Obrador receives a replica of the Presidential sash. 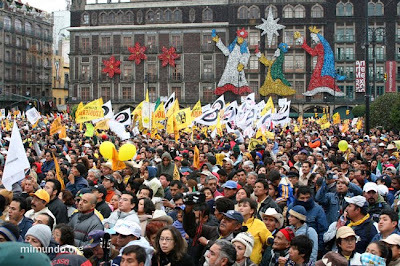 AMLO supporters assured no one was forced or paid to attend. Posted in: Photo Essays. 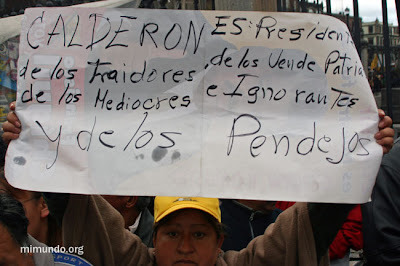 Tags: elections, lopez obrador, mexico. Dude, Obrador won, We all know that. Big coverup by the main stream press.